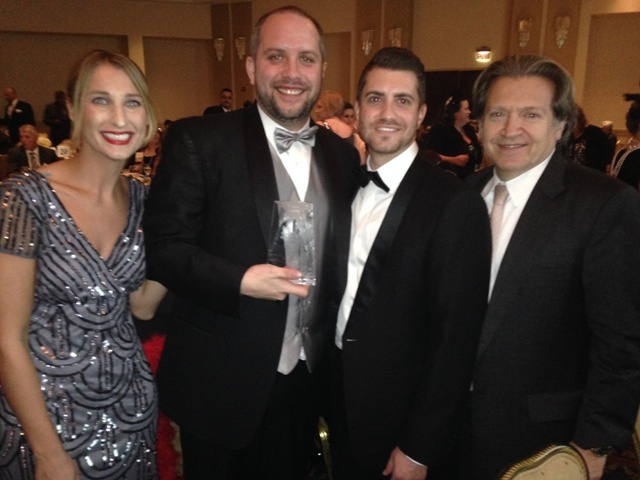 BNE Real Estate Group was honored with six awards at the 21st Annual Garden State Awards of Excellence sponsored by the New Jersey Apartment Association. From left to right: Kristina Hedden, Vice President of Marketing; Jeff Fenner, Area Property Manager; Seth Cohen, Executive Vice President – Head of Operations; and Alan Pines, Partner. LIVINGSTON, N.J. – BNE Real Estate Group, a national real estate development organization with more than 60 years of experience, was honored with awards in six categories at the 21st Annual New Jersey Apartment Association (NJAA) Garden State Awards of Excellence banquet on Oct. 30th at the Hilton East Brunswick. BNE took home three individual awards and three overall property management awards. BNE’s management arm, BNE Management Group, was the big winner of the night, taking home the highly coveted “2014 Management Company of the Year” award in the market-rate, under 2,000 units category. Two of the company’s luxury rental buildings, Warren at York in downtown Jersey City and Twenty50 near the George Washington Bridge in Fort Lee, were honored with “Excellence in Property Management” awards. Jeff Fenner, an Area Property Manager for BNE, won an award for excellence in the “Property Manager” category. Soo Yu, the Leasing Manager for Twenty50, was honored for excellence in the “Leasing Agent” category. Barbara Karp, a Leasing Associate at BNE’s The Club at Autumn Ridge active adult rental community in Union Township, rounded out the evening for BNE by winning an award for excellence in the “Customer Service Manager/Resident Relations & Activities” category. Hosted annually by the NJAA, the Garden State Awards of Excellence honors leaders in the state’s multi-family rental housing industry. BNE was among the more active participants in that industry this year. This year alone, the family-owned company launched leasing for Warren at York, a 139-unit luxury rental building in downtown Jersey City’s historic Paulus Hook neighborhood, Twenty50, a 194-unit ultra-luxury community that pioneered the recent redevelopment in Fort Lee near the GW Bridge, The Monarch, a 316-unit luxury mid-rise rental building in East Rutherford, and Water’s Edge at Harrison, a 141-unit luxury rental community a few blocks from the Harrison PATH station. Based in Livingston, BNE builds and manages properties across the country. The company boasts a track record in virtually every type of product category, from low- and high-rise apartments to luxury townhouses and single-family homes to mixed-use developments. For more information, please visit http://www.bnerealestate.com. For more information on the NJAA, please visit http://www.njaa.com.